She had it all — beauty, money, children, and an important husband. Then last Thanksgiving, it all began to fall apart. The cracks in their relationship became a chasm too deep for them to enter and too wide for any amount of money to build a bridge for them to cross and return safely back to their home. Their story can be repeated a thousand times over. I've had similar stories told to me today from literally all over the world. And I've heard them before — a church leader whose wife survives cancer but who gets caught up in a devastating leadership conflict, the young engaged woman who calls after the rehearsal dinner to say the wedding is off the next day, and the man who has given everything to his job for over 25 years to only find he is let go with still another kid to get through college. Little cracks become chasms. Little problems become crises. Little wounds fester and become life threatening abscesses. Each of these stories — these problems, the wounds, these crises, these conflicts — remind us of the original one. They remind us of the broken world we have inherited because of the original chasm carved so many years ago. We find that story in the early chapters of the Bible (Genesis 3:1-15). Hiding and Ashamed — the chasm between us and GodThen the man and his wife heard the sound of the LORD God as he was walking in the garden in the cool of the day, and they hid from the LORD God among the trees of the garden. But the LORD God called to the man, "Where are you? "He answered, "I heard you in the garden, and I was afraid because I was naked; so I hid" (Genesis 3:9-10 TNIV). Blaming the Other — the chasm separating relationshipsThe man said, "The woman you put here with me — she gave me some fruit from the tree, and I ate it" (Genesis 3:12). Blaming Creation — the chasm with our universeThen the LORD God said to the woman, "What is this you have done? "The woman said, "The serpent deceived me, and I ate" (Genesis 3:13). Notice that once humans had rebelled against God, the separation was not just with God. The crack in that relationship became a chasm in every area of life and resulted in death. Their relationship with each other was marred by blame and pain. This break in relationship was fully realized when one child killed the other over their worship of God. The creation, once benevolent and beautifully created just for them, now became a source of pain, destruction and death. The cracks became chasms. Perfection gave way to brokenness. And we are caught up in the awful effects of each chasm! And I will put enmity between you [Satan] and the woman, and between your offspring [demonic realm] and hers [promised Messiah]; he will crush your head [deadly blow], and you will strike his heel [hurtful blow]" (Genesis 3:15, notes added). We see this promise played out in the story of Jesus. The early believers believed that in Jesus, God built a bridge across that chasm, paying the price to close the gap, heal the wound, and bring us back to himself. The price was high — the death of Jesus on the Cross. But the distance was closed and reconciliation and restoration won! But when the set time had fully come, God sent his Son, born of a woman, born under the law, to redeem those under the law, that we might receive adoption to sonship (Galatians 4:4-5). Yes, we will all find ourselves in times of darkness. However, on the dark side of our mountains, God comes again and again to bring us light and lead us across the chasm on the bridge he built to bring us home. This is the story of Jesus (John 14:1-3), but it is also the story told over and over again in the stories of God's people — those who lived in Bible times and those of us who live today. 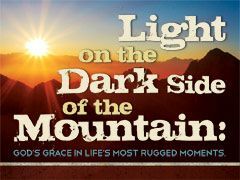 Let's look for God's light on the dark side of our mountains! "Building the Bridge to Bring Us Home" by Phil Ware is licensed under a Creative Commons License. Heartlight encourages you to share this material with others in church bulletins, personal emails, and other non-commercial uses. Please see our Usage Guidelines for more information.